Add the butter and olive oil to a pan and warm over low heat. Once melted, add the chopped garlic. Raise the heat to medium and add the cream and 2% milk, stir constantly. Add the salt, pepper, red pepper and the cheese. The sauce will thicken a lot, so be sure to keep stirring. Once the sauce thickens, remove from the heat and let sit. Now it’s time to prepare the nachos. Preheat the oven to 400°F. Add the chips to a baking dish. Add the garlic sauce, then the onions, pepperoni, olives and chopped green pepper. Cover the nachos with the Colby Jack cheese and place the baking dish in the oven until you see the cheese has completely melted, about 7 minutes. You can use any combination of ingredients. 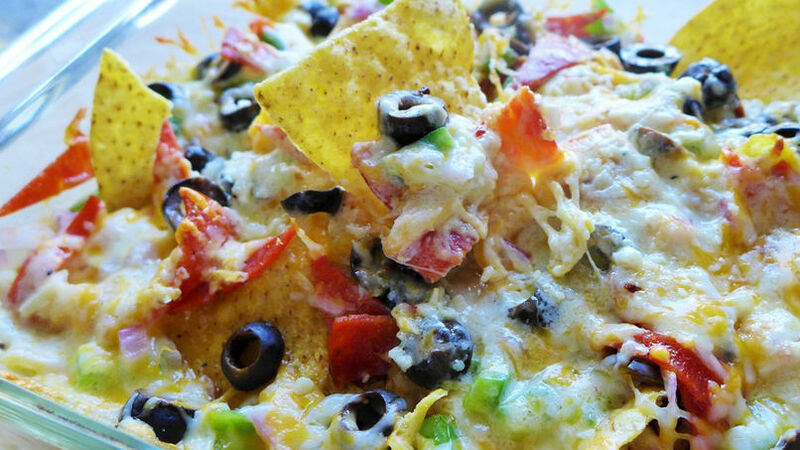 Nachos add to the festive nature of American football season. Despite being Peruvian, these celebrations have become part of my life. In just a few minutes you can prepare a delicious appetizer that none of your guests will be able to resist. The best part of these Pizza nachos is that you can make them using your favorite ingredients. Feel free to change any ingredient and use any combination.